So this last week has been really interesting for me. My older two kids started school on Monday (my youngest starts Kindergarten on the 19th!) and while this usually brings about a sense of relief and much needed quiet in the house, my daughter's bus accommodations have somehow fallen through the cracks so I've been dealing with endless frustration at the incompetence and disorganization with our school district's transportation department instead. I was thrilled to be able to soap on Tuesday (temporarily get my mind off my petty troubles) and I made some Apple Jack & Peel soap, the first in my fall line. I decided I would make this my Holly Swirl entry for the Great Cakes Soap Works challenge this month. I really love how this came out. So now I will post the making and cutting videos that have been uploaded on my YouTube channel below if you'd like to see me make this and cut it the same night. It's actually crazy for me to be able to cut my soap the same day I make it. I soap at room temperature and usually try my best to prevent gel so it's generally at least 24-48 hours before I can cut my soaps. I knew this fragrance would heat up so preventing gel would have been fruitless. I simply left it out to do it's thing and went to check on it 8 hours later and it's ready to unmold. 2 hours after the unmold I couldn't handle the wait so I cut it. It's AWESOME!!! Ok here are the videos... thanks for reading and watching and best of luck to all who have entered this contest!!! Wow, wow, wow: absolutely stunning! This is my favorite so far! Love the colors and the fragrance together. I love it! Colors are so rich, warm and vivid and goes perfectly with the fall theme of your fragrance! The swirls look amazing! Really nice color choices for the Apple Jack Peel! Wonderful. great color choices and fantastic presentation. Very beautiful soap! Love those high-contrast colors! 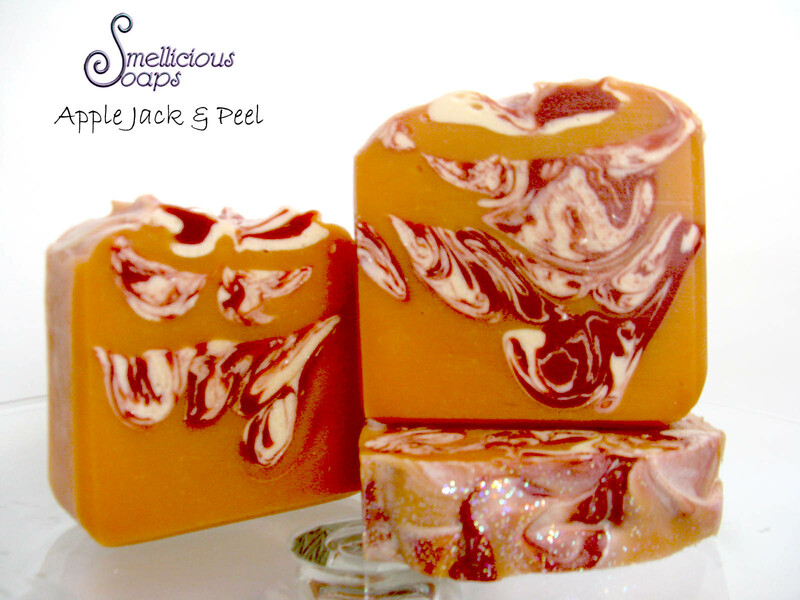 I love the way this turned out, the colors and swirl are very striking and perfect for a fall soap! Beautiful soap, I have the same glass mixing bowl that I did my ITPS in as well. Very pretty, the colors are stunning. Beautiful colors, and I love how distinct the swirls are! Beautiful, love the bright colours & your swirl, the orange is very nice! Gorgeous! The swirl really came out nice. love the colors and swirl. wow. nice! I could not hear to well. Which colors did you use?